Taliban political chief Sher Muhammad Abbas Stanikzai, in the first row, second from left, and other Taliban officials pray during the intra-Afghan talks in Moscow, Feb. 6, 2019. Taliban and influential Afghan opposition leaders concluded a rare two-day “peace meeting” in Moscow on Wednesday, where they jointly declared that a complete withdrawal of U.S.-led foreign forces was key to a lasting peace in Afghanistan. A post-meeting declaration noted that participants also agreed to support ongoing U.S.-led direct talks with the Taliban to seek a negotiated settlement to the Afghan war, now in its 18th year. The Russian Embassy in Kabul said members of the Afghan diaspora in Russia organized the dialogue, though delegates privately acknowledged the host government played a major role in arranging it. Former Afghan President Hamid Karzai, second from right in the foreground, applauds during the intra-Afghan talks in Moscow, Feb. 6, 2019. A 10-member Taliban delegation from the insurgent group’s Qatar office attended the conference under the leadership of their chief negotiator, Sher Muhammad Abbas Stanikzai. 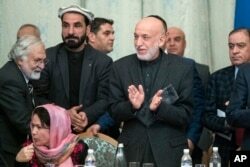 Former President Hamid Karzai led the group of about 40 politicians from Afghanistan, including presidential hopefuls, former officials, warlords, tribal elders and female rights activists. “This meeting here in Moscow, it was very successful, and we agreed on many points,” Stanikzai told reporters at the end of the two-day deliberations. But the U.S.-backed government in Kabul was not invited to the conference because the Taliban have persistently refused to engage in any talks with Kabul until all foreign forces leave Afghanistan. President Ashraf Ghani criticized and dismissed the Moscow gathering as an attempt by his political opponents to undermine his constitutionally elected administration. The rigid insurgent stance also forced Washington to exclude Ghani’s government from talks between U.S. and Taliban officials seeking a political resolution to the conflict. Ghani’s former national security adviser and his rival in the upcoming presidential election, Haneef Atmar, defended the Moscow gathering as an important step toward initiating an intra-Afghan peace dialogue. He told reporters the Afghan delegation was in fact trying to help Ghani’s government to become part of the peace process because the Taliban do not want to talk to him. “The intra-Afghan dialogue will be all-inclusive. No Afghan will be excluded from this process. So, it includes people from the government. This is a breakthrough in the [peace] process,” said Atmar. 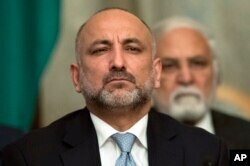 Former national security adviser Haneef Atmar attends the intra-Afghan talks in Moscow, Feb. 6, 2019. “The effort now is exactly with the purpose to have an integrated peace settlement in which the withdrawal of troops will be one element,” Atmar said when asked whether the meeting demanded complete withdrawal of forces by the U.S. and its allies. The Moscow talks took place days after U.S. special representative for Afghanistan reconciliation, Zalmay Khalilzad, reported “significant progress” in his latest round of negotiations with the Taliban in Qatar, where Stanikzai led the insurgent team. Both sides noted they had agreed “in principle” to a framework on key issues, including a Taliban guarantee that Afghan soil would not be used in the future for terrorist attacks against the U.S. in return for Washington's withdrawal of its forces from Afghanistan. Khalilzad and his team are due to meet with the Taliban again in Qatar on Feb. 25 for more discussions. President Donald Trump in his State of the Union speech Tuesday hinted at a possible U.S. military drawdown, saying his administration has accelerated negotiations with the Taliban to reach a political settlement in Afghanistan. “As we make progress in these negotiations, we will be able to reduce our troops' presence and focus on counterterrorism. … We do not know whether we will achieve an agreement, but we do know that after two decades of war, the hour has come to at least try for peace,” Trump noted.